In February 2017, in accordance with state law, Grambling State University submitted findings related to misuse of Tiger1 card accounts to the Louisiana Legislative Auditor and the Third Judicial District Attorney’s Office. “We are committed to continuous improvement and accountability at all levels,” he said after a report detailing the issues from prior administrations was made public by the state legislative auditor Monday. (Oct. 30). 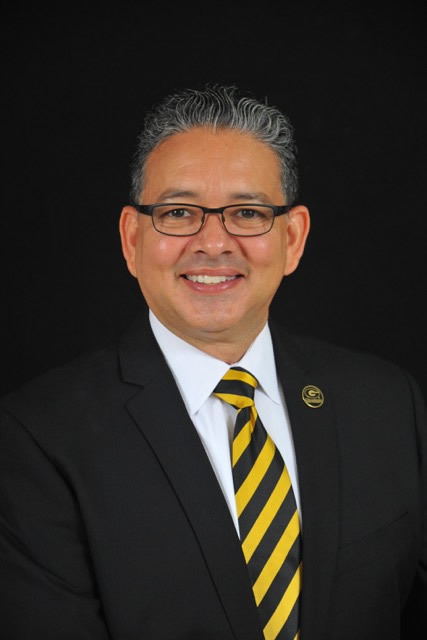 In the letter to the auditor, Gallot noted that employees involved were dismissed and “leadership changes have been implemented” in GSU’s Office of Finance and Administration and by food service contractor ARAMARK. The Tiger1 card accounts being investigated are based in the office of finance and administration. Gallot expressed his thanks to the internal auditor’s office, Louisiana Legislative Auditor, District Attorney, and the State Police for their continued commitment and support. The full report is available at www.lla.state.la.us. Chef Jaaion Barnes prepared some New Orleans-style barbeque shrimp on two large skillets on a table as bystanders watched, anticipating a taste of the delicacy he was preparing. Dressed in a blue, long-sleeved button down and white pants and a black apron, Barnes kept looking at the seafood, checking the temperature of the flames and adding splashes of salt, pepper and a homemade creole sauce as Harrington Harris and Jon Weatherspoon licked their lips outside on The Yard. 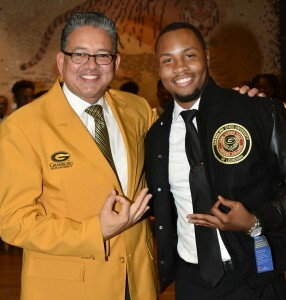 When Barnes was done, he putted them to the side and Grambling State University students quickly starting grabbing them. Harris, 21, a senior mass communication major from Phoenix, gave Barnes two thumbs up when he tasted the spicy shrimp. “It’s the best shrimp I’ve ever tasted,” said Harris, who likes to cook only breakfast food. 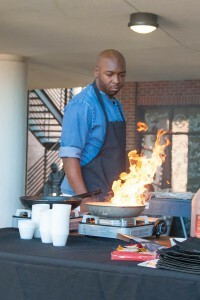 Barnes, a chef who has appeared on Bravo and Aspire TV, is based in Atlanta, where he is a chef for events and celebrity clients. He returned to Grambling to celebrate homecoming with friends and colleagues and he wanted to give back. As a 2005 graduate of the university’s hotel and restaurant management program, he asked to set up a special opportunity for students and others to taste what he’s done with the culinary skills he developed at GSU. 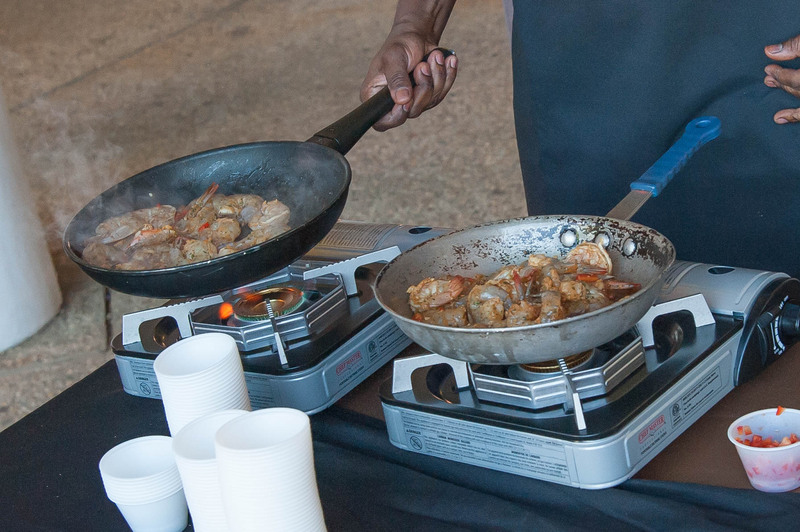 Students came out in droves on Wednesday to chow down on Barnes’ tasty seafood during a food tasting event on The Yard. It was an event Barnes had worked on since the summer. 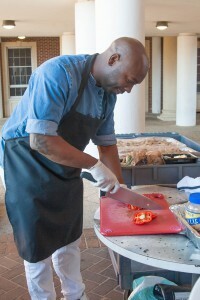 Barnes began his career at 18 years old at the Cheesecake Bistro in New Orleans, working as a line cook. After he graduating from Grambling State, Barnes moved to Atlanta to further his education at Le Gordon Bleu Culinary School of Arts. While pursuing his culinary arts degree, Barnes worked his way through the ranks at Cheesecake Factory. He was ultimately promoted to the kitchen manager and in less than two years after he earned his degree. He took his career to newer heights after a four-year stint with Cheesecake by accepting the position of corporate executive chef at the Atlanta Hartsfield-Jackson International Airport, the world’s busiest airport. After working at Hartsfield, he served as a culinary instructor at his alma mater the Le Gordon Bleu. Several students in attendance raved about Barnes’ food. 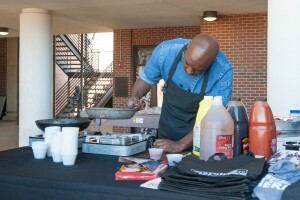 Some asked if could he start a cooking class at Grambling State. It’s an idea Barnes said he’s considered. 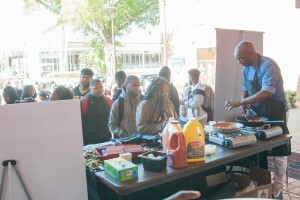 Barnes said a culinary program might be in the works, and it could be a two-year degree program His goal would be to see the initial culinary program become a four-year program. 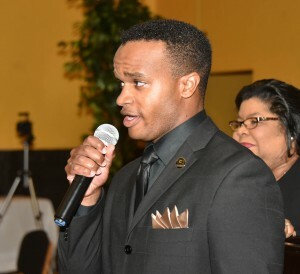 “It was good giving back to the university,” said Barnes. 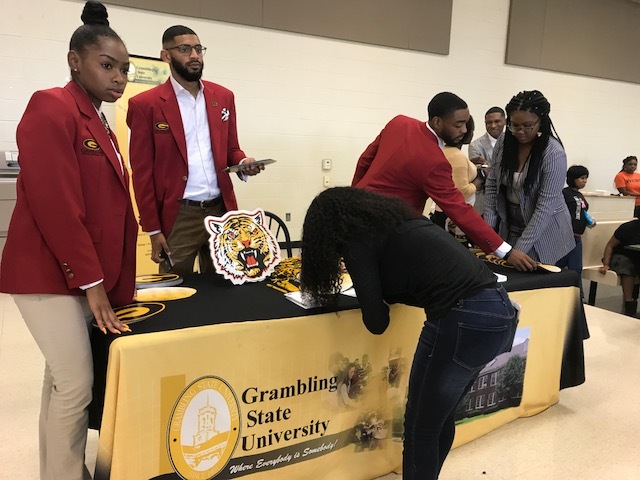 Rear Adm. Sylvia Trent-Adams, the U.S. deputy surgeon general, was excited to be asked to speak at Grambling State University’s Nursing Leadership Summit. Unfortunately, due to an unforeseen change in her schedule, she will not be able to attend the Oct. 26-27 summit. The summit has been postponed and will be rescheduled for a later date. The summit date will be based on her availability. Refunds for ticket purchases, advertisements and sponsorships will be issued by the GSU Office of Advancement. 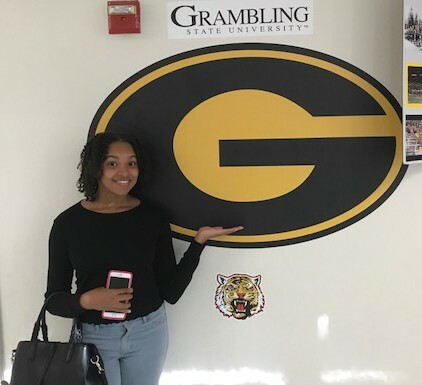 Please contact Vel Malone (malonev@gram.edu) in the GSU Office of Advancement or call (318) 274-2217 for refund information or to ask questions. This entry was posted in Uncategorized on October 11, 2017 by Greta Carter. Grambling State University is celebrating a $2,000,000 increase in federal grants and contracts awarded. Excluding federal Title III funding, federal funding increased from $3.6 million in the 2015-2016 fiscal year to $5.6 million in the 2016-2017 fiscal year, a 55.55 percent increase. Health, and the Air Force. Walton said these projects support the university’s recruitment and retention of students as well as their academic preparedness. The faculty who are involved in these funded programs infuse into the curriculum knowledge and skills gained from the projects. Many of the funded projects provide support for student scholarships and stipends. 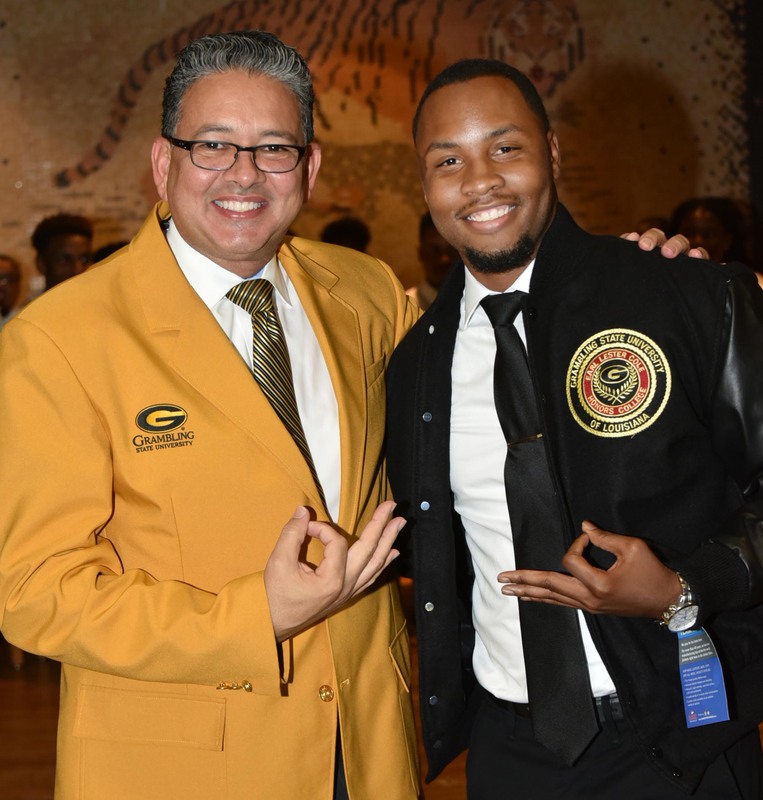 According to Marc Newman, GSU’s vice president for institutional advancement, the increase is the result of a lot of hard work by many individuals. These individuals include the faculty, staff, and Dr. Connie Walton, interim director of the university’s sponsored programs office. Walton noted that the increase in funding that was realized was due in large part to the high priority the administration has placed on the acquisition of grants. 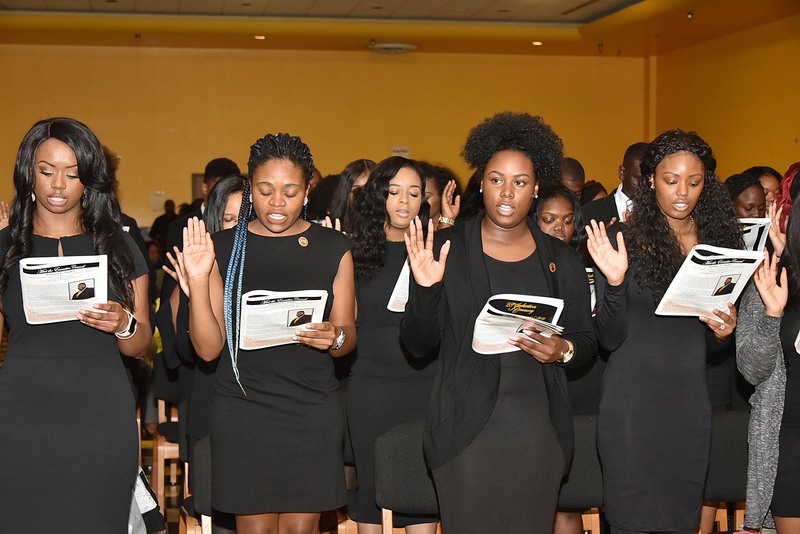 She indicated that it was not unusual for President Gallot and Provost Smiley to share funding opportunities with the office of sponsored programs and in some cases even suggest whom should be on the proposal writing team. 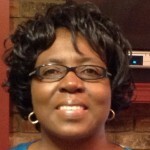 Mrs. Teresa Jackson, research analyst in the office of sponsored programs, worked closely with Dr. Walton in expanding the services offered. Newman praised the team for expanding the sponsored programs services, in part by providing faculty assistance with proposal writing. 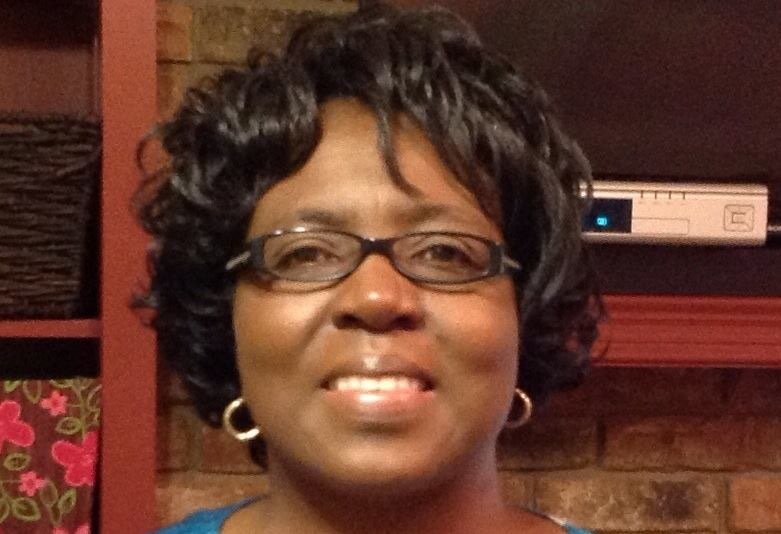 “We are appreciative of the hard work of faculty and staff,” added Newman. 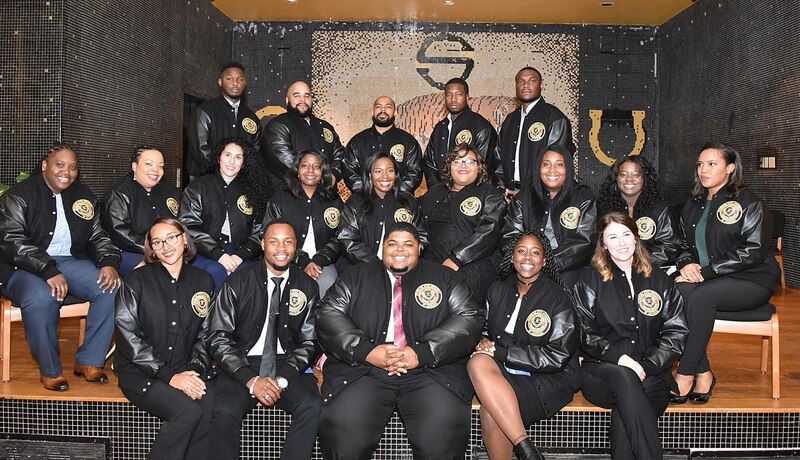 The GUNAA Dallas Alumni Chapter of Grambling State University is hosting several events during the 2017 State Fair Classic this weekend to bring GSU alumni, fans and friends together for a good time and to support the university. 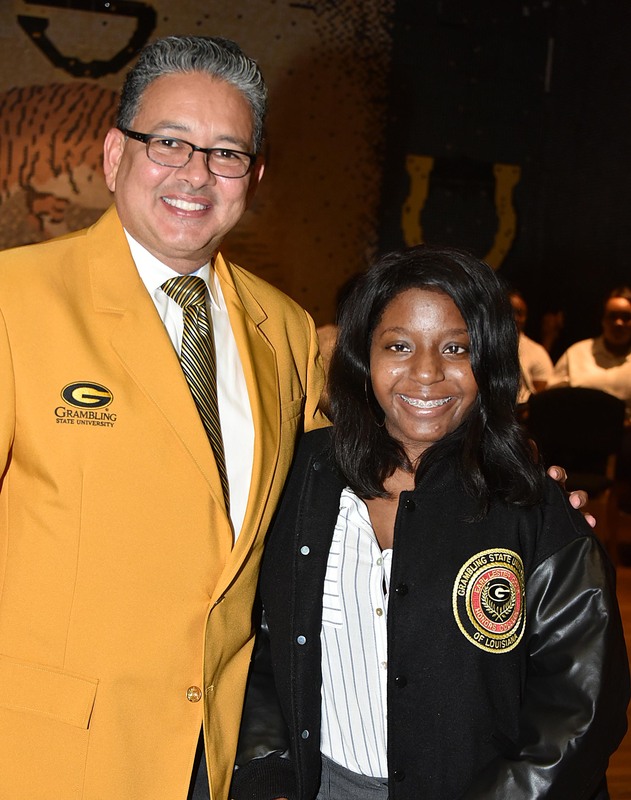 Cathy Conwright, vice president of the Grambling University National Alumni Association and first vice president with the Dallas chapter, said the weekend of events helps strengthen the university’s presence in the community, helps alumni bond and introduces the institution to school students as GSU ambassadors and the royal court visit area schools. 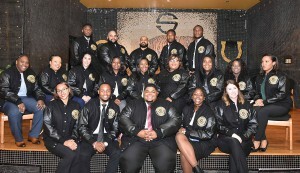 The chapter is hosting a Friday night “Welcome Soiree” at the Hilton Anatole Hotel in the presidential “Hospitality” Suite at 7 p.m. Fans in town for the game are welcome to attend the free event. There’s a “Battle of the High School Bands” Saturday at 8 a.m at Lancaster High School in Lancaster, Texas. Tickets at the gate are $15. High school bands will compete for the right to strut their stuff with high school cheer squads during a pre-game show at the classic game featuring GSU and Prairie View A&M University at the Cotton Bowl at the State Fairgrounds in Dallas. The big game kicks off at 4 p.m. Thousands of GSU and Prairie View fans are expected to stroll through the fairgrounds before the game before they enjoy the gridiron action. When the game is over, the chapter is hosting a Saturday night “Victory Turn Up” at the “Gossip Bar” at the Hilton Anatole Hotel’d first floor, Tower Side, at 9 p.m. The event is free for people attending the game. Miniya Shabazz is a junior mass communication major from Laurel, MD. 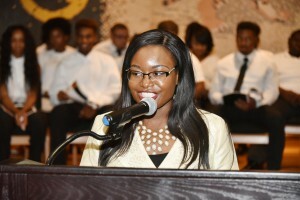 She attends Grambling State University and is a staff writer for The Gramblinite. 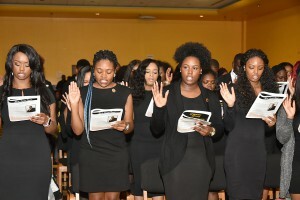 The Earl Lester Cole Honors College at Grambling State University inducted 50 students in ceremonies Monday at the Black and Gold Room of the Favrot Student Union. 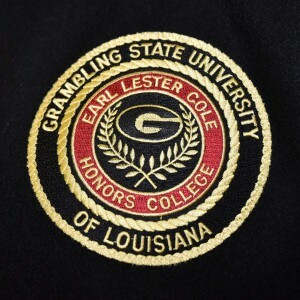 The Honors College was named after Earl Lester Cole, who began his tenure at Grambling in 1936 as a science teacher and was appointed vice president in 1969. 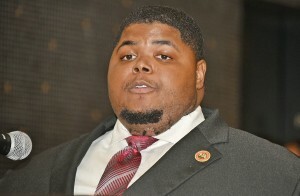 He was affectionately called “Dean Cole,” even after he assumed the vice presidency. He is remembered for his active involvement in implementing curriculum, which is considered to be the cornerstone to courses still being offered at Grambling. Even after his retirement in 1977, Cole remained active at GSU and continued to advise members of the faculty and administrators. He passed away at the age of 89. 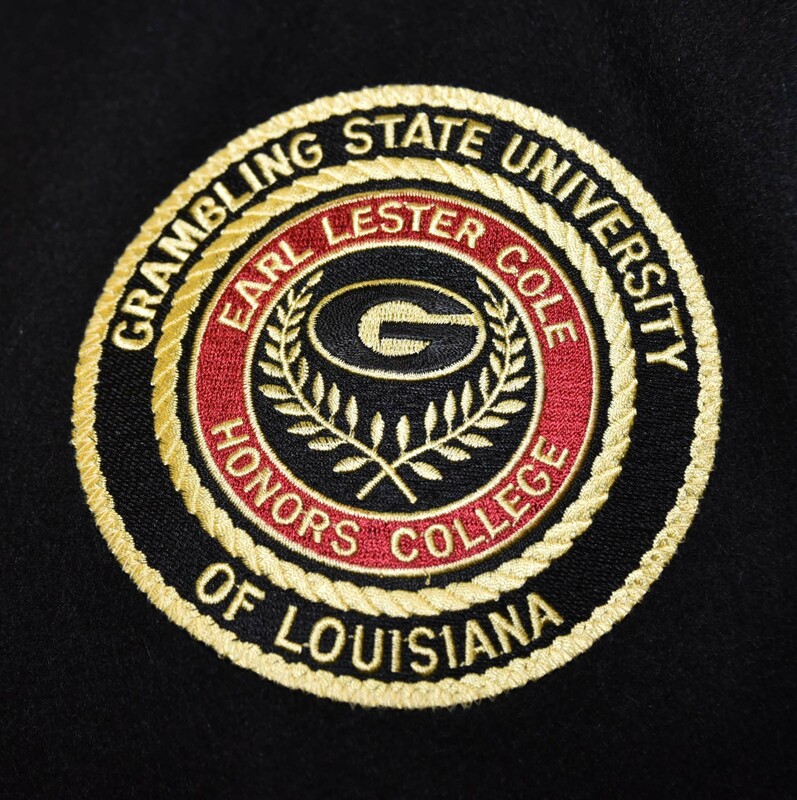 Academic requirements for the Honors College are a 3.5 cumulative grade point average. 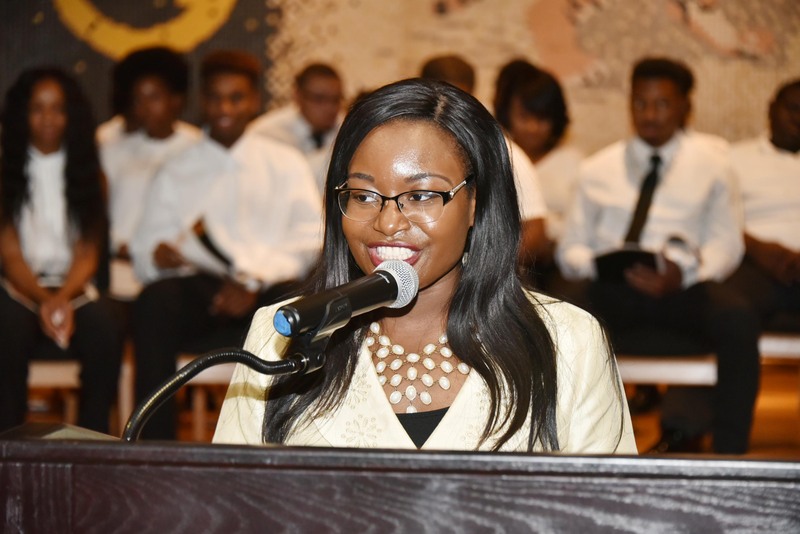 This year marked the 28th induction ceremony for the Honors College.